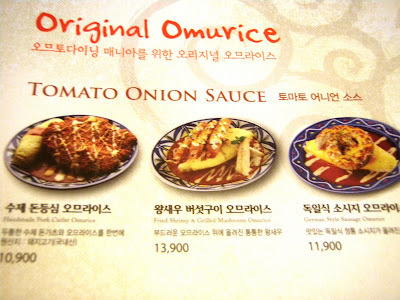 Omorice is one dish that Korea is truly unique for, but makes sure to try it at the right place like Omuto Tomato. Tomato onion sauce accompanies the traditional omorice dish. An omelet with rice? Who on earth would want to eat an omelet with rice, Koreans are so weird. This was all I could think as I was sitting inside of a standard Korean chain called Kimbap Heaven during my first week of work. Finally after living in Seoul for 8 months I tried what Omuto Tomato has dubbed as omorice. A good friend of mine introduced me to this quaint restaurant in the middle of chaotic Myeongdong. Omuto Tomato specializes in omelet fusion with over twenty different kinds of omorice dishes. 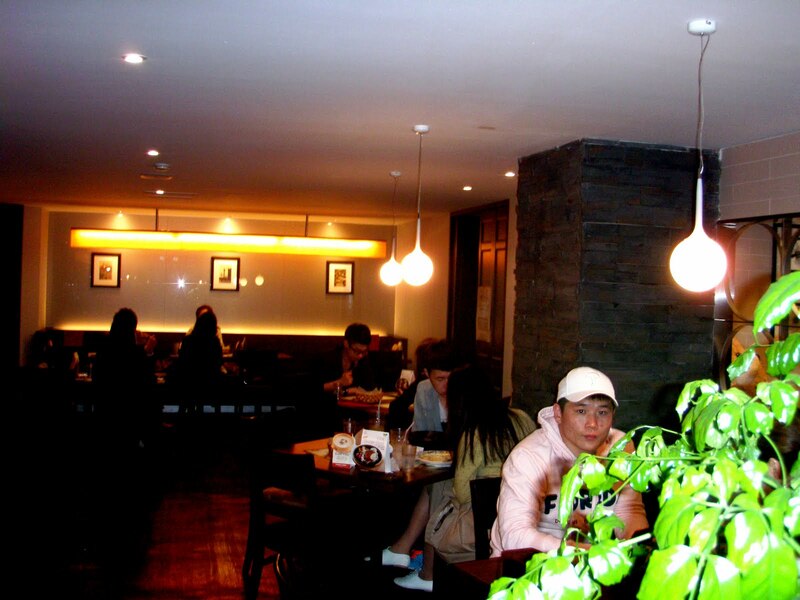 The inside of Omuto Tomato takes you away from the crazy streets of Myeongdong. So for those of you who are still wondering what an omelet filled with rice taste like, there are so many varieties that this creation will to appeal to anyone. From crabmeat omorice, to handmade pork cutlet omorice, German style sausage omorice, and fried shrimp and mushroom omorice you are bound to find something you like. 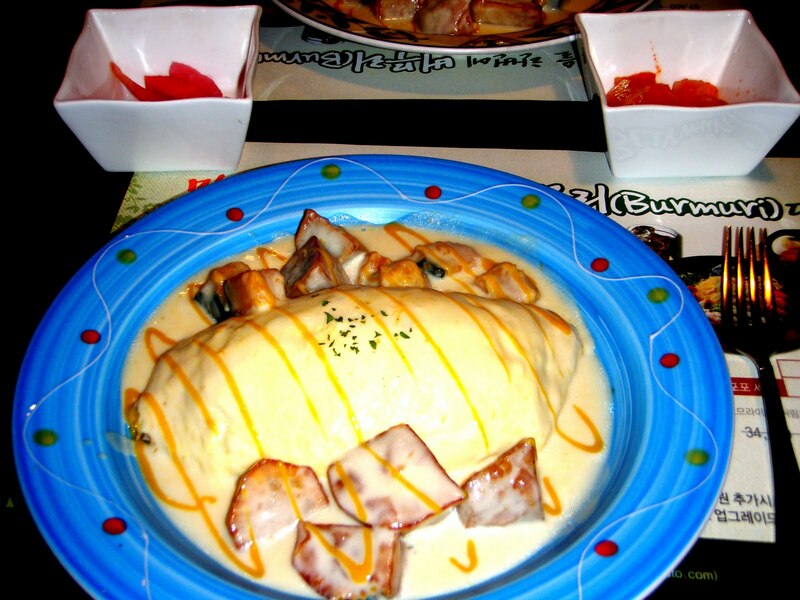 Each omorice is simply an omelete filled with rice and topped with different sauces and fillings. I tried the pumpkin and sweet potato omorice for 8,900 won. I was a little worried about trying this dish, mainly because omelets are one of my favorite foods and I didn't want to ruin a good thing. However, when the dish arrived I had no problem polishing off everything on my plate. The rice goes surprisingly well with this sweet dish of egg and creme-like sauce with perfectly cooked pumpkin and sweet potato. The prices are very reasonable here ranging from 8,000 to 15,000 for omorice. There are also other items on the menu, but they specialize in the omorice fusion dishes. Get a coupon for 10% off by visiting Visit Korea Year and printing out the required page. There are also very detailed directions for the restaurant on this site. Take Subway Line No. 4, get off at Myeong-dong Station, and leave via exit 8. Walk down the alley between Crown Bakery and Family Mart for about 80m. Omuto Tomato is on the left, across from Shinhan Bank. great david! I hope you enjoy it here!! 15,000 for rice and eggs is not "reasonable"